One lady had finished the table cloth we started on a class in may. I have finished my top, but not basted and quilted it. I made both the summer and the christmas version. 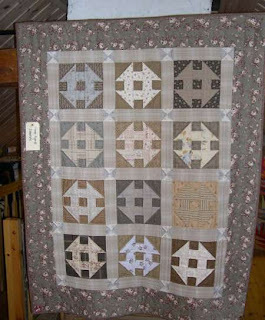 A beautiful bowtie quilt with applications. The flowers are made of hexagons. Laila had played with the square in a square ruler and this is what she made. One lady have made this quilt as a gift to a kindergarten. It is so cute and I guess the children there will be happy to get it. 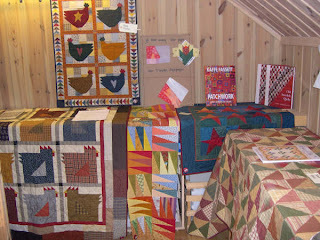 A chicken quilt in flannel. Some happy children. This is actually one of my designs :) Made it long time ago. A Sun Bonnet Sue bag. Tomorrow my DD is coming home. I'm so happy. It is two weeks since she left home and I miss her so. But as long as she enjoys her stay at the shool I'm happy. I had no idea it would feel so good relaxing all weekend. I thought I would be bored, but I did not. Perhaps relaxing is something we women forget to do. We always have to do something. Housecleaning, making dinner, washing clothes, shopping, sewing, sewing, sewing......... So my advice to all of you: Take time to relax, it feels sooooo good. And you get more energy to sew. 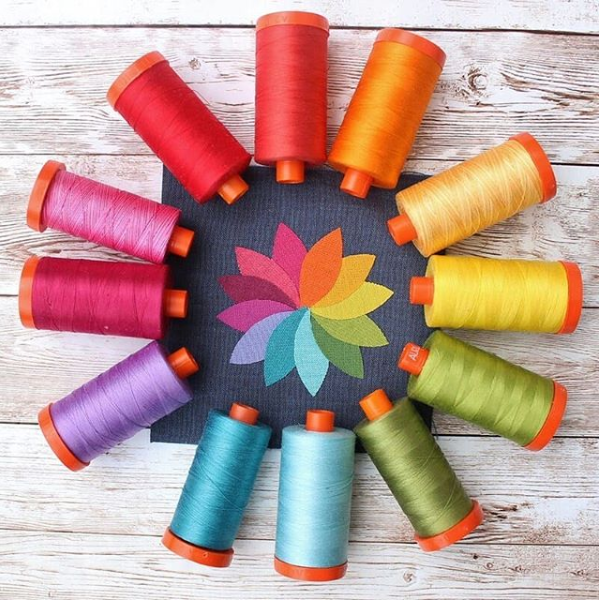 I guess (hope) I have soooooooooooooooooooooo much energy to start sewing again when my arm is ok again. I have got so many ideas now so.................... My physiotherapist was very optimistic but told be to be very careful the next weeks. I have no idea what the title on the cover says LOL. It would be fun to know!!! I do not understand a single word of japaneese but the patterns are easy to follow. A lot of good pictures that explains how to do. and the house and little wallhanging. A lot of lovely projects in this book. This house is protected by killer dust bunnies! Doesn't this look yummy. Waffels out in the sun was delicious. Autumn is starting to come in Norway and when the weather was so lovely as this weekend we had to enjoy every minute of it out in the sun. Nine good friends at the cabin. This was the 10th time we are having our quilt weekend together. All the others brought a lot of sewing, but I had to relax my arm. So this is the way I've been sitting all weekend. Relaxing in a chair, with my arm on a pillow, looking at the others and wanting to SEW!!!!!!!!!! But I know my time of sewing will come. Soon I hope. The arm is stiff and I have not so much strength in it. Not so much pain but I guess that's because of the painkillers. I'm off to the physiotherapist tomorrow. I told everyone to find their bags and exhibit them out on the stairs. And we counted to 26 items. Divided on nine ladies :) A real quiltlady has more than one handmade bag. In for surgery 08:00, woke up 11:15 in the room. surgery ok, but they had to do more than expected because my shoulder was a mess :) Home by 14:00 with a lot of pain killers. A bit dizzy. Hugs to you all. Thanks for all your lovely thoughts. These last days I have received some quilt goodies in the mailbox. Want to see.................???? First I got an envelope from Lappemor and Hanne. A beautiful pattern which have been on my wishlist some time. And a T-shirt with Lappemors logo on. I will wear it for sure. Love her logo. I guess Hanne fixed this when she visited this shop on her summer holiday. Thank you both for a lovely surprise. 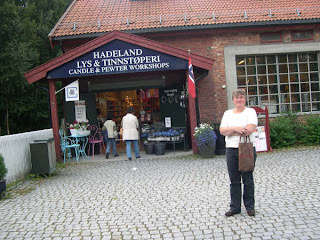 I did not get the oportunity to visit Anne Heidi's shop when I passed through Tynset, but I promise I will soon. These stories makes me think. 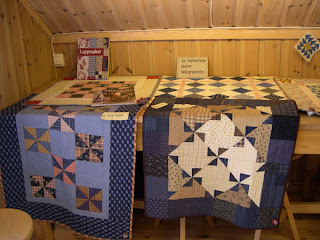 In old times women had their quilting bees where they met around the quilt, telling stories, quilted and had fun. Now in modern time we meet in blogland, sharing ideas and photos of our hobby. Making good friends all over the world. 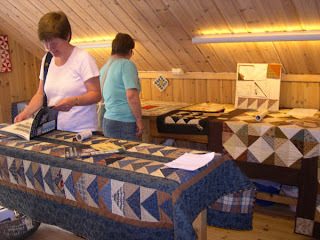 Perhaps this is the modern way of having a quilting bee. And today the fabric I have ordered from Northern Quilts arrived. Look how pretty they are. I have this pattern that I want to make, but none of my fabrics was what I wanted. How odd...... LOL Anyone else out there having the same problem????? 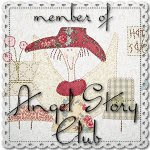 ................yesterday I had to find my stitchery and do some stitches. I used a very short thread as my physiotherapist told me to do. I manage to sew slow, very slooooooow and rested while changing to a new thread. It felt sooooooo good. This evening I will trace some new stitcheries to bring with me to the cabin this weekend. I do not know if I'm able to sew anything, but I have to bring it with in case I can. Oh yes.....I got my Secret Santa friends name today. I know exactly what to make for her. And Donna................ I promise to be a good girl and not tell anything to xxxxxxxx. This weekend have been very hectic. My DD is going to Buskerud Folkehøgskole (a boarding school). Her brother and his girlfriend came to visit us before she was leaving and we had a great time playing the game Sequence. It is a board and card game which is very fun to play. Sunday morning she had packed everything she wanted to bring with her and we drove to the school. It's only 3 hours driving from home so she is not that far away. A lot of expectant boys and girls was already there when we arrived. Unloading all their stuff from the cars, and moving in to their rooms. Here she is in her room. A tiny room which she is sharing with another girl. She is going to study photo and perhaps also have lessons in playing guitar and theatre. They have a lot of classes to choose between. It's a creative school an I know she will love it. I wish her the very best for this schoolyear. This morning I got a comment from Holly, New York, that I want to reply. But Holly, you did come up with no reply and I have no chance to reply to you. So please email me again with your emailadress. And this is also a request to all the others with "no reply" on your blog. Please check your profile and allow your email adress to show. It will make it easier for us to reply your comments. My Scrabble© Score is: 22. My score is 22. Saved by the letter Q that gave me 10 points. I remember we used to play scrabble long time ago and it was very fun. Have to see if I can find that game again and bring it with me when we are going at the cabin next weekend. I guess I will not be able to sew very much just a few days after surgery, so playing games would be fun to do. Three good friends on a day trip. We started early monday morning and headed for Oslo. First stop was at Ikea where we looked around. I bought a couple of glass jugs where I intend to fill with buttons, pins aso. Photo further down of them. Then we drove further to Bærums Verk. This is a lovely place to walk around. 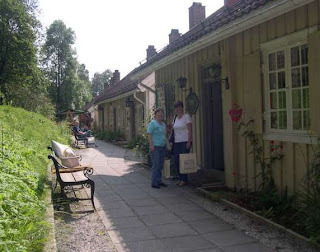 There is a lot of cosy shops there, and one of them is Lappemakeriet. 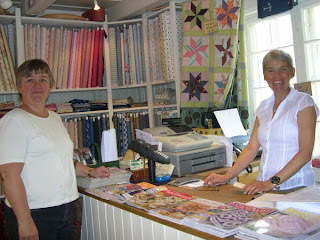 A beautiful quiltshop. Look how cosy it is in front of the shop. An old tiny restored building that is now a quiltshop. Let's go inside the shop...... There I met Tullemor, a friend of me that works in this shop. And of course we had to do some shoping. 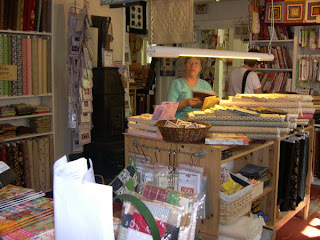 Here is Irene (in the front) and Britt (behind) looking at the books and fabrics. Upstairs there was a exhibition called "Triangle at the attic". I have just started to play with triangles on a roll and I got a lot of ideas after seeing all the beautifull quilts there. You see what I mean. 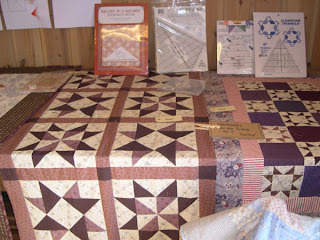 I love these quilts and I want to sew...............right now!!!!!!!!!!!!!!! Have to buy more triangles on a roll first. I only have the one that makes 2" squares. 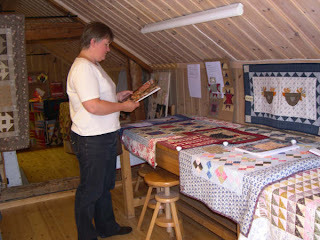 After shopping fabric, books, buttons and boxes at the quiltshop we drove furter to visit Hadeland Glassverk. Hadeland Glassverk is beautifully situated in Jevnaker, just an hour north of Oslo, in idyllic surroundings at the southern tip of the lake Randsfjord. The glassworks was founded in 1762 and is the oldest industrial company in Norway that can claim continuous operation since its foundation. With its 190 employees the glassworks today not only represents a large and thriving industry undergoing constant development, but also significant operations linked to the Visitor Centre. The company boasts a significant historical and cultural heritage, while at the same time focusing on continous development and new design. Our Visitor Centre welcomes almost 600.000 visitors annually, and is thereby one of Norway's most popular tourist attractions. 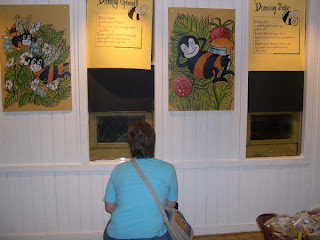 One of the shops "The Honey house" had real beehives inside the shop. Luckily behind glass. I did not go near to look properly at them because I hate bees!!!!!!! But Irene took a close look at them...............yeeeek. We had a great day together. And will make this trip next year too. I bought these fabrics at the quiltshop. Lappemakeriet has a lot of repro fabrics. And I love repro fabrics. 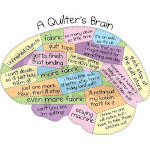 I'm collecting them and hope to make a big repro quilt some day. And here is the glass jugs I bought at Ikea. Imagine them filled with buttons. One with white buttons, one with red, one with blue aso. I have to buy more of these!!!!!!!!!! Will look nice in my sewingroom. the days pass quickly when I am sewing.